Tweedle Dee and Tweedle Dum are constantly fighting, but that isn’t what makes their ape friend travel to Wonderland. Rather, a cheshire cat, a battle with the Jabber Wocky and a series of rather interesting events send him forth. I thought that this story was going to be about Tweedledee and Tweedledum. Until I slowly realised that it is about an orangutan in the circus… which Tweedledee and Tweedledum are part of. Talk about a rapid change of direction! 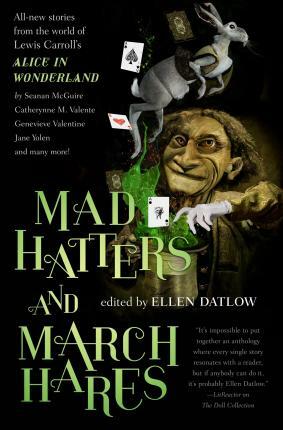 Tweedledee and Tweedledum are both such humorous characters, but it wasn’t until I read this story that I really wondered how such human-like creatures could be in Wonderland. And then it really wasn’t until the very end that I felt like this was a great beginnings story. How the Tweedles made it to Wonderland, where the idea of “off with your head” came from… and so many other things. The connectivity between modern-day circus performers and acts, the Cheshire Cat and the world of Wonderland was incredibly fun. And I was mostly just disappointed that the story was over so quickly… after all, I wanted to know more about the man-ape that took centre stage.